Oy. We were able over the last weekend or so to get the glass part of things mostly set up, so I feel llike there's a studio of sorts out there. Thanks, Shop Guru. It's because of him that it's anywhere near ready. 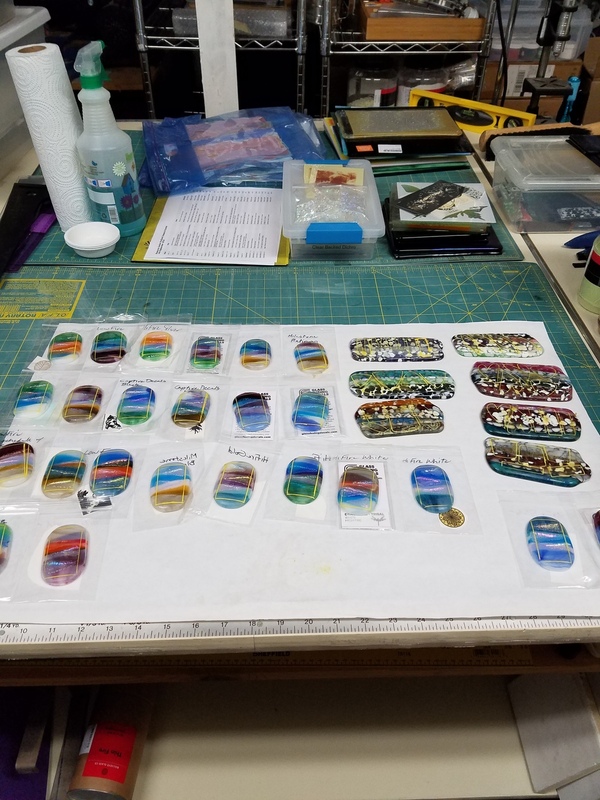 The rest of February and all of March, we spent preparing for upcoming markets, and the Glass Guild's annual glass gallery, which I decided to participate in this year. What was I thinking? I was sure I didn't have enough pieces. I've also signed up for a new market, through October, that was originally geared more towards artisans. It's out in Woodburn, and I participate once a month. I've been to exactly one market, and so far, well, we were there on Opening Day, so we'll see if the crowds improve. It's in conjunction with Hillsboro Farmer's Markets, so that's a tried and true program. My next one is tomorrow. I'm hoping that traffic has improved over the last month, as I've been told that the marketing for it was going to be stepped up. We'll see what happens. All the nerves aside about not being ready, and trying to move while it was going on, it was a great experience! Met lots of wonderful people during the event, got a few orders, and some ideas for some work to come! There's a photo of our booth on the market photos page. Pebble "patties" after firing, preparing for coldworking. The whole lot, ready to be cut into their final shapes. The saw's ready and waiting!! All the individual ones have decals in the individual bags underneath them to keep them separate. It's decal mania! I've done pieces with enamel paint on firing paper a lot lately and this is somewhat similar, only in that they have to be kept separate or it's a mess. I've devised a way to determine which decal I've chosen for which glass piece while the piece is in coldworking, we'll see if my method works. I've had trouble with the ink I use coming off during coldworking, so I'm hoping that my new method will hold up. Shortly after my last post, the news here in Portland literally started blowing up about unsafe chemicals being deliberately sent into the air by both Bullseye and Uroboros. Knowing the folks at Bullseye like I do, I knew this to be untrue. There was such public outcry without any concrete information, and a lot of reactionary statements and threats made against the employees and owners of Bullseye simply for being associated with them. There was even a special session held by the DEQ to propose temporary rules to halt production that would have severely hampered all the glass companies in the city. Multiple glass artists either spoke at the meeting or e-mailed civic leaders to speak out against these temporary rules until all the scientific results were received (based on pending test results) so sweeping regulations wouldn't be seen as reactionary and arbitrary. I was one of those glass artists speaking out for Bullseye. As a result, any new regulations were delayed until test results could be received. Granted, there were tests done that did show abnormally high levels of arsenic and cadmium in the mosses around the Bullseye factory for a given period, but DEQ wanted to halt production of glasses that used trivalent chromium, which wasn't part of the original issue. One of the scientific reports can be found here: http://www.bullseyeglass.com/about-us/dr-lacourse-chromium-statement.html. Bullseye has since installed new filtration systems at their own insistence. From what I understand, Uroboros has been following these issues very closely but I haven't heard about any changes that they have made to their filtration. I don't use as much Uroboros glass, so I don't speak with them as frequently. What annoys me the most about the entire situation, aside from the staff and owners being threatened for performing their jobs, is the fact that the DEQ came in and just assumed guilt when there was no evidence to back that up. From what I read, at least one of the days that the arsenic levels was highest was a day that the factory wasn't even producing glass - has that been addressed? Not that I've seen. I certainly can understand wanting to keep the families in the areas around the glass factories safe, but come on. I did just like all the other COE 90 artists did, and bought as much glass as I could during the February sale, all the while discussing with one of the staff members how I wasn't worried that Dan and Lana would find a solution. So now I have all this "overstock" glass since I got so much in February - although some of it I bought then was in different frit sizes than I normally use. But not to worry - it will all find a home in a glass piece at some point. And I just heard this evening through some of the glass forums that Spectrum Glass is closing it's doors after 40 years. There will be more to come from that announcement I'm sure. Ok, that's all for now. Ready for the next market, tomorrow at Woodburn Outlet Mall. Hope to see you there!